Black 100% acrylic marking paint designed to block out unwanted lines. Ideal for changing traffic patterns on parking lots. 250-300 lineal feet of 4-inch line per gallon. 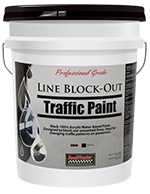 Line Block Out Paint is a latex emulsion paint designed for blocking out unwanted traffic markings and striping. Line Block Out Paint can be sprayed, brushed or rolled. Allow paint to dry thoroughly before resuming traffic. Temperatures must be above 50ºF both during application and for a period of at least 24 hours after application. Do not apply when rain is imminent or forecast.